Preparing for my LIVE TV debut! When you tape a show for HGTV, you go through six hours of filming to get 15 minutes of on-screen love. Not so for live TV! I will learn more about how that works TOMORROW when I will appear on the set of AM Northwest, a popular local morning news show on KATU in Portland (channel 2! 9 am!). From time to time, teachers from the DIY Lounge are invited onto the show to demonstrate crafts and promote their classes (my friend Linda Womack recently demonstrated her beeswax collage). I am teaching a kids art class on Saturday mornings starting this weekend, so when I was invited on the show, I decided to come up with a project that kids can do. 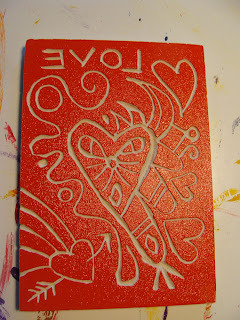 I rounded up my daughter and one of her friends (they are 8th graders), and the three of us will be in the spotlight for five whole minutes tomorrow morning, making some fun Valentine's Day cards using simple printmaking techniques. 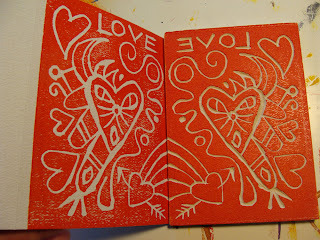 Now, as you probably know, I am totally NOT a printmaker and I have never even done this before, but I did help to modify the 4th grade Pop Art lesson at Duniway School last year, when we switched it to a printmaking class. 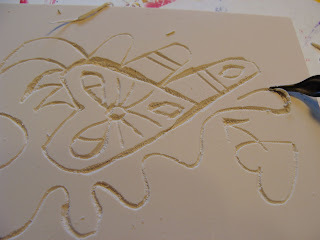 I also helped out a couple of weeks ago in Julius's science class at Da Vinci - the kids were making animal prints and it was so easy and fun I figured I could do it too. But please bear in mind that this is designed to be a project for young people and I am not claiming to be a big expert on printmaking! If you happen to watch the show, let me know! I will hopefully be able to post a link to the show some time after it airs. 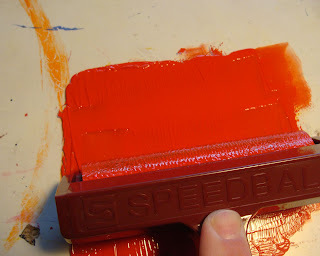 I am using Speedball brand "Speedy Kut." It comes in small pieces for about $3 each. You can actually use both sides so it's like getting two for the price of one. 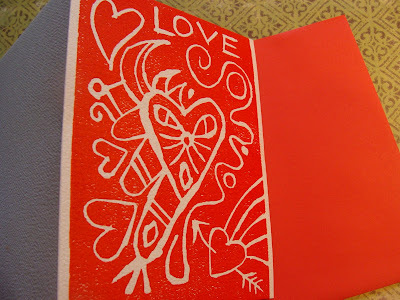 You'll also need some water soluble block printing ink (I am using red and magenta), linoleum cutters, brayers to roll the ink, something to roll the ink out on (I am using some pieces of Plexiglass), and some cardstock to print on. I scored mine first to make it easy to fold. 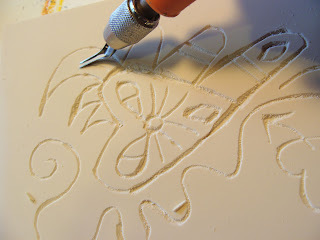 Start carving your design into the Speedy-Kut using a linoleum cutting tool. I started out by making a heart and then somehow or other it took on the face of a cat. Oh, well. I was also planning on doing some sort of heart-based mandala design, but instead it came out rather abstract and strange. If you want to add any words, you have to make sure to write them backward, as your print will be a mirror image of your design. 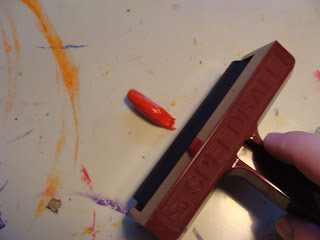 Squirt some ink out onto your Plexiglass tray (you could even do it directly on a table top as it washes up with water). Roll it out. You will hear a nice squishing sound. 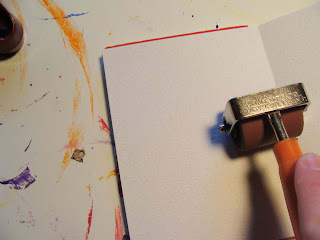 Your purpose is to get your brayer coated with the ink. 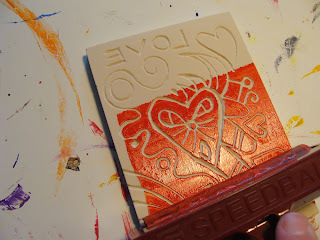 Now roll your ink-coated brayer over your carved block. Coat it completely. 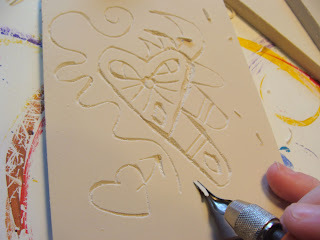 Place your cardstock over your inked block and press down on it by rolling it with another brayer. Make sure you rub it down all the way to the edges. 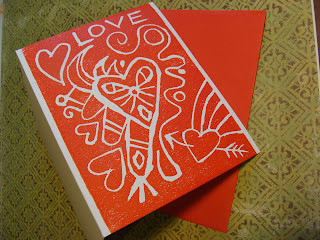 You can keep inking and printing until you make all 24 Valentines that your kid needs to take to school on February 14! 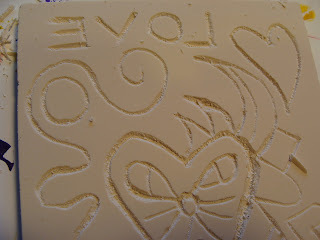 You can also blot the ink or let it dry on the block and then recoat it with a different color for your next run! 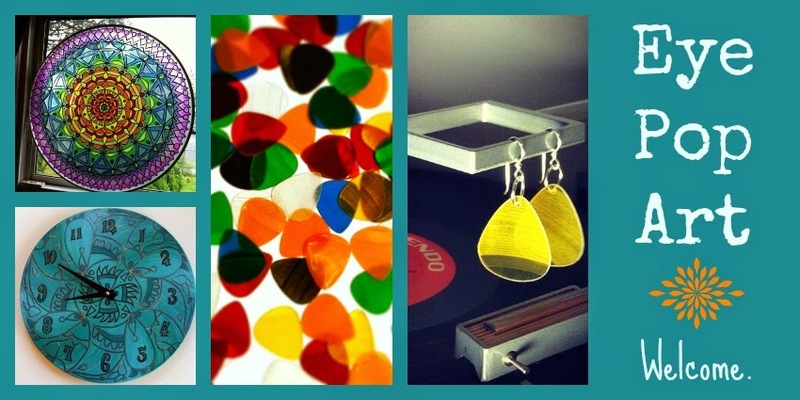 And, you can mix colors or layer them in weird ways. You could also embellish your cards by drawing on them with markers ( a black line might look nice) or adding glitter or whatnot. Add matching envelopes and you're set to go! The finished size of my card when folded is 4.25" x 5.5" so you can get two cards out of a regular size 8.5" x 11" piece of cardstock cut in half to 8.5" x 5.5" and scored at 4.25". 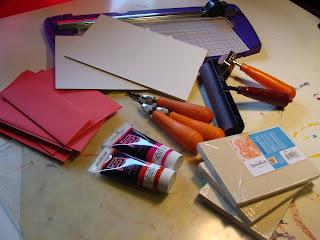 Try to use recycled or reclaimed paper if you can - if you are in Portland check out SCRAP for amazing deals on salvaged paper. The paper I used for this project was all "end cuts" that were donated to Trillium Artisans by a print shop. 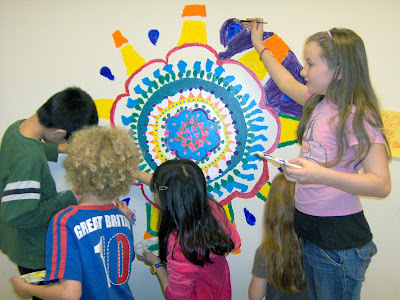 There is also a great way to do this project for younger kids. 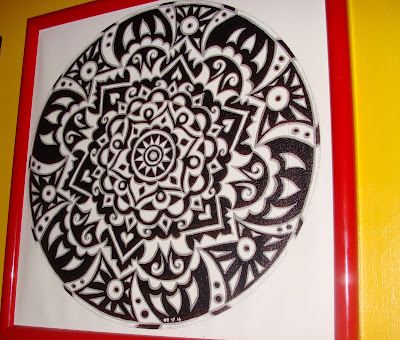 You just give them blocks of styrofoam and they can impress their design with a pencil. Styrofoam is really bad for the environment so only do this if you have some old styrofoam picnic plates sitting in a cupboard - please don't buy it new! Isn't this just The Bee's knees? I drove Tangereen to school this morning (two hours late because we had SNOW!!! ), and was delighted when several of her friends stopped me in the hall to tell me they saw my artwork in The Bee, a community newspaper based in the Sellwood neighborhood of Portland, OR. I was so excited I had to rush over to Starbucks to get a copy of the new February issue. 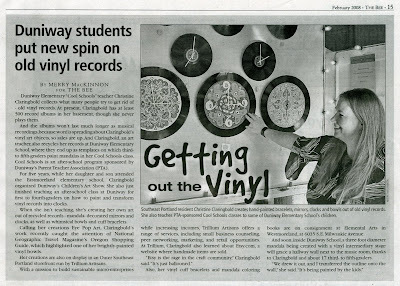 There's an article about me, called "Duniway students put new spin on old vinyl records," on page 15. Here's a link to the article online! 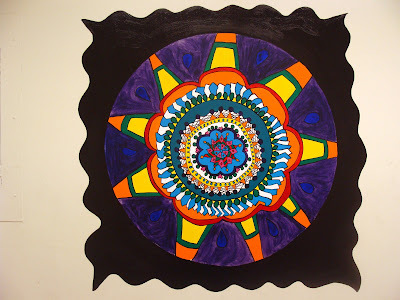 It's about some mandala classes I teach at an elementary school where the kids made clocks out of vinyl records and painted an awesome mandala mural on a wall. 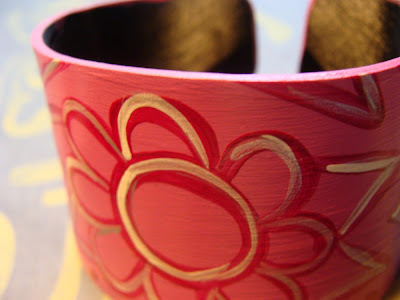 It also talks about my involvement with Trillium Artisans, and it's about Etsy too! 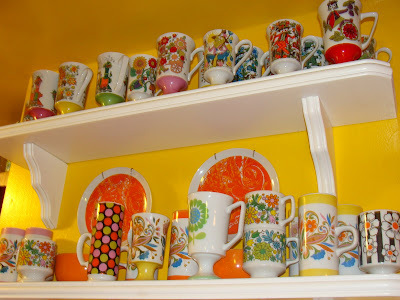 At Trillium, Claringbold also learned about Etsy.com, a website where handmade items are sold. "Etsy is the rage in the craft community," Claringbold said. "It's just ballooned." 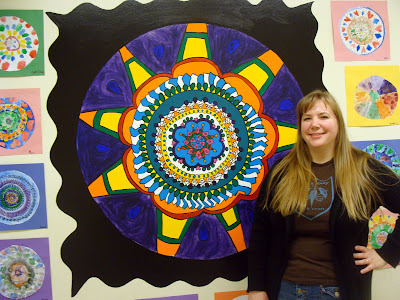 Last week I finished this mandala mural at Duniway Elementary School. I am so pleased and proud of the finished product! 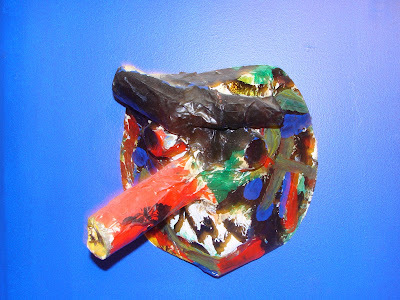 The design was totally created by the kids that took my four-week after school class. 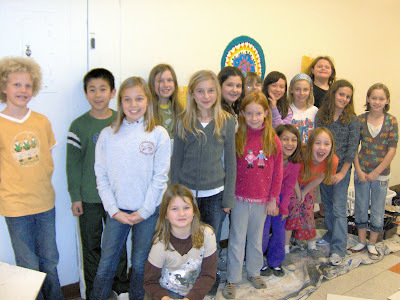 There were 17 kids in the class, ranging from third - fifth grade. 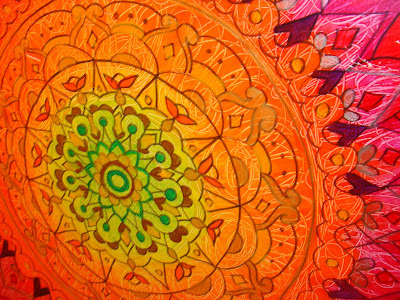 During the first class session, I showed a slideshow of mandalas. 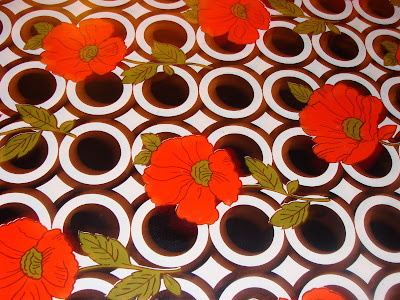 Then, I put a large piece of paper down on a table, on which I had drawn several concentric circles. 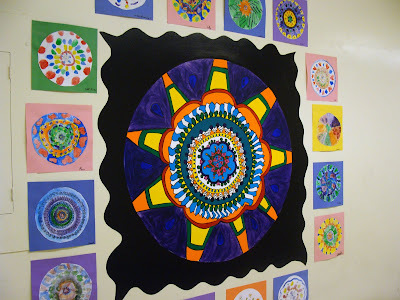 I had the kids come up one at a time and, starting from the center of the circle, they took turns adding layers of patterns until they had filled up the paper. 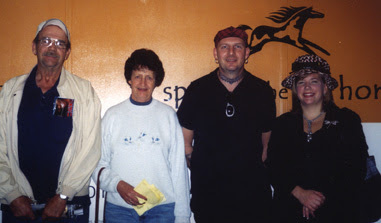 I took this large paper to Kinko's and had it reduced down to fit on an 8.5 x 11 transparency. 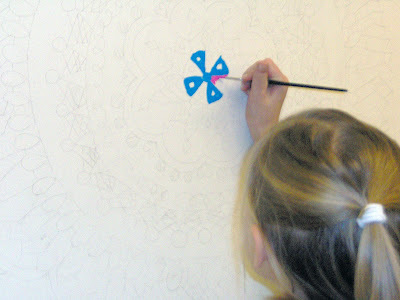 I then projected the design onto the wall and drew it on the wall with a pencil. By the time of the second class session, we were ready to start painting! 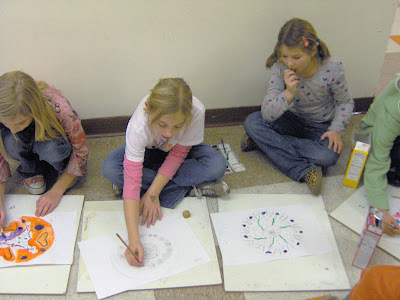 While waiting for a turn to paint on the wall, the kids sat on the floor and worked on their own watercolor mandalas. 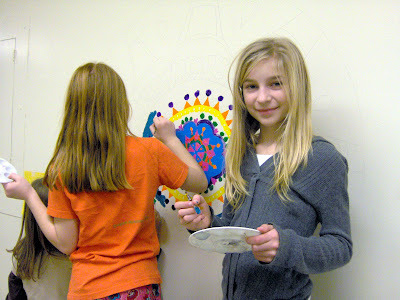 By the last class session, we were able to have several kids painting at the same time. They did an amazing job and got most of it done. Afterwards, I touched it up, added some second coats, and outlined the entire design with black. 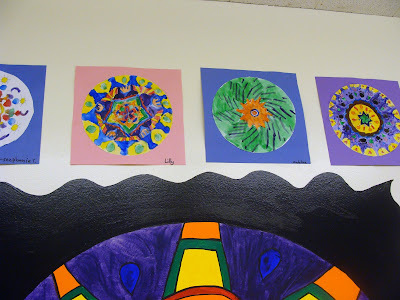 Finally, I took all their lovely watercolor pieces (which parent volunteers had helped to cut out and mount on squares of colored construction paper) and hung them all around the mural. 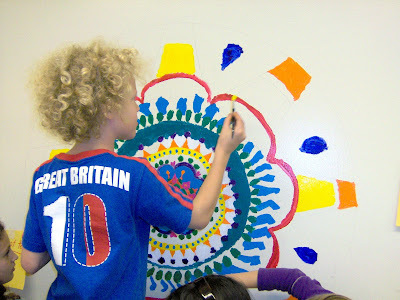 The school principal has given us permission to expand as much as we like down that same hallway, so I will be offering another mural class (this time for little kids - 1st - 3rd graders!) starting in late February, and hopefully we'll do more in the fall as well. 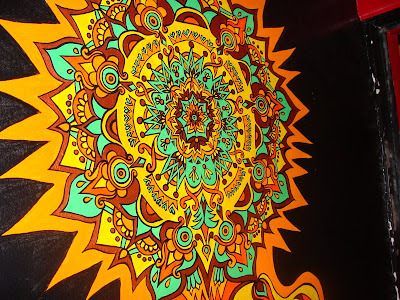 I'd love to make this whole hall become one big, gorgeous "mandala tunnel." 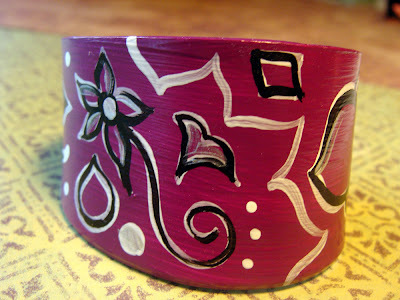 Macro Mania - new cuff listings! Here are some of my first macro photos using my new camera. 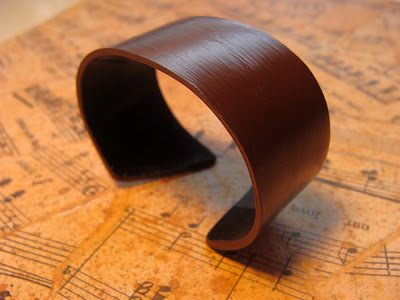 These three cuffs are now listed in my shop. Yay! These are just some of the first shots I took with the brand new camera I got for Xmas. (Thanks, Chuck!) I totally haven't figured out the settings yet, I am just throwing these out there. I need to figure out how to not make it blurry, etc., I know, but I already like it better than my old camera. It really captures the vivid colors quite well. I haven't done any Photoshop stuff to any of these pictures, which is pretty cool. I've never been able to get a good picture of the above mural because it's in a weird, narrow dark area and my old camera couldn't handle it. Now I need to study up and figure out how to use my macro setting so I can get decent pictures of my new cuffs to list in my shop. That's on my list for this weekend...I also need to fill out a questionnaire for buygreen.com - they would like to carry my products but need to rate the "greenness" of my business first. I've also been working with a gentleman in Montreal who is opening a new gallery, possibly to be called "Upcycle," and is planning to place a wholesale order for my Mandala Record Bowls. So I'm gearing up for that while also trying to tackle all the good new year's tasks, such as updating my website which is hopelessly out of date! PDX Etsy is planning a cool Valentine's themed craft show, but I'm gonna skip it due to not having much product in stock. I need to get ready for the SE Area Art Walk the first weekend of March. I also just got in my application for Buckman, so I'm keeping my fingers crossed in hopes of getting into that one again! 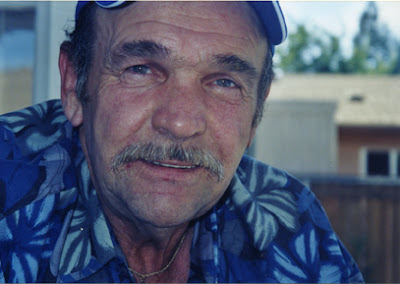 Chuck and I went over and had lunch at our friend Julie's house today. She and her friend Noelle are starting a cool paper crafting business called Nudge, and they are applying to join Trillium, so I picked up some samples for the product review committee. Julie is way cool and always gives me cool funky stuff. It will be great to have her be a part of Trillium! 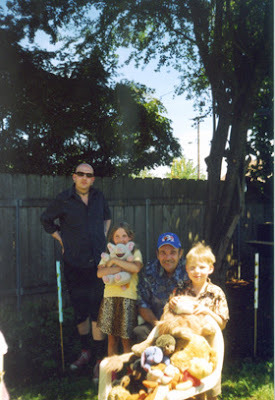 ...making a big stuffed animal pile in the backyard. 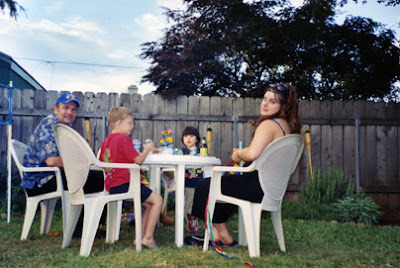 ...having a picnic with our friend Gretchen and her son, Logan. 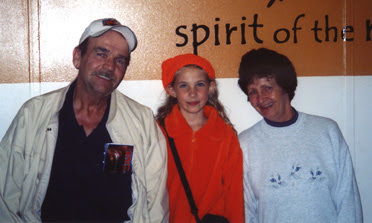 For some reason, my daughter Tangereen has always loved the color orange! 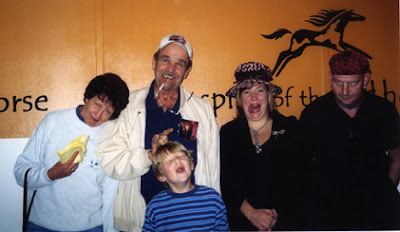 We will always treasure our memories of Grandpa Claringbold. 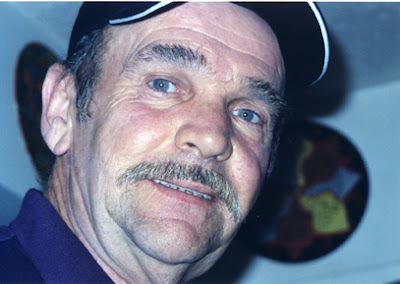 I have had a wonderful holiday season which just ended on Saturday, January 5 - my birthday. Charles made me a wonderful brunch, then took me out for coffee and to the Portland Art Museum, where we were amazed and delighted by the Chuck Close exhibition. 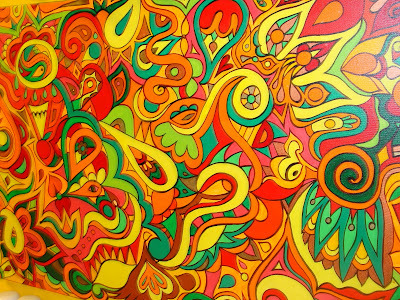 The rug pictured above was probably my favorite piece. Going to the art museum on my birthday is an annual tradition that I love! It is such a great way to get inspired for the new year. We finished off the day by meeting up with a bunch of friends at the Horse Brass Pub for Portland's best fish & chips. 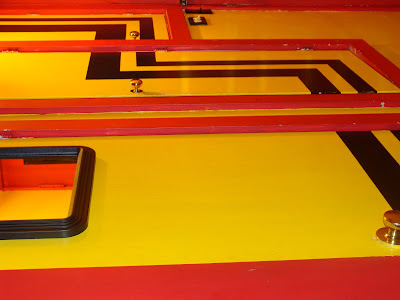 And now it is Monday, the kids are back to school, and I finally have a chance to blog again! Sorry for the big gap in posts. Somewhere in between Crafty Wonderland and the PDX Etsy sale, I got hit with a bad cold, missed a week of work at Trillium, and somehow managed to ship out an insane number of orders. I got better in time to enjoy Christmas with family and friends, and to host a raging New Year's Eve party followed by the celebration of our 12th wedding anniversary on New Year's Day. Throw in a birthday and you can see why I had no time for blogging! 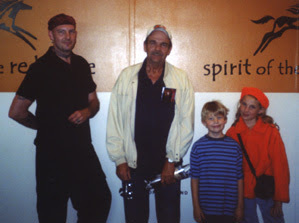 But I am back now and hope to keep this little journal up to date in 2008!